The value of children’s books is found not only in how they help our kids develop a love and passion for reading from an early age. Giving them access to kid’s literature is extremely important for their future success and development. Studies show that reading is important in the development of the cognitive skills that enable our kids to succeed in a school setting. But, giving kids access to the best children’s books is valuable for some other reasons too. Donna Norton, professor emerita at Texas A&M University, College of Education, identifies the value of children’s books for kids in her book, Through the Eyes of a Child (2010). Children’s books are important because they provide our kids with opportunities to respond to literature; by helping them to develop an appreciation for their own cultural heritage and that of others; help our children develop emotional intelligence and creativity, and nurture the growth and development of their personalities and social skills. Whether we read to our kids on the lap or at bedtime, we are interacting with them in a nurturing environment where a lot of good systematic learning takes place. Often we aren’t simply reading to them. We are also pointing out the letters and sounds, helping our kids start to see the relationships between letters and sounds, vocabulary and concepts. We’re helping them extend the language. When your child is reading a children’s book like More Than I Can Count, she does far more than just sound out a word like “tyrannosaur.” She also distinguishes whether a “tyrannosaur” is a person, place, or thing. She contextualizes the story in her head (Tyrannosaurs weren’t really ticklish, were they?). In other words, reading the stories found in children’s books is an incredibly complex task requiring understanding far beyond the mere ability to sound out words. Quite literally, when we help our child to learn to read we help him acquire knowledge of not only how language works, but how the world works. So how can we best help our children develop a love for books, and set the stage for reading excellence? First, we must make certain we don’t expect more from our kids than is developmentally appropriate. Doing so may frustrate them, and short circuit their natural enthusiasm for stories and books. 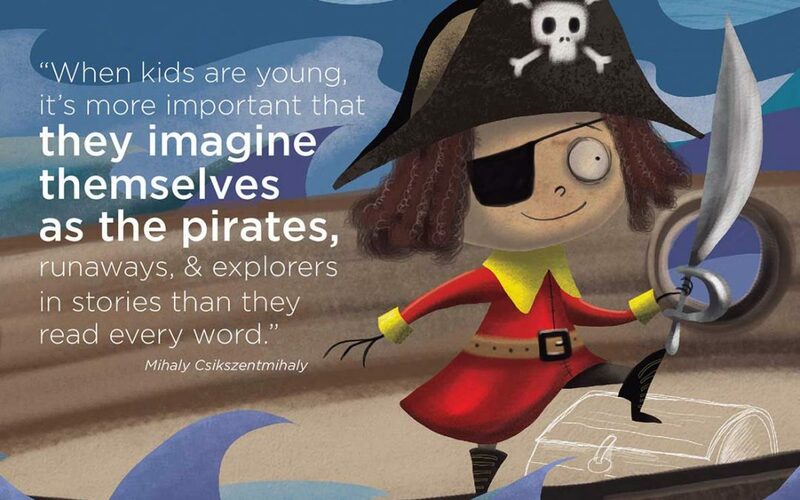 Mihaly Csikszentmihalyi, professor of psychology at Claremont Graduate University, in California puts it this way, “When kids are young, it’s more important that they imagine themselves as the pirates, runaways, and explorers in stories than they read every word.” In other words, as parents, our aim should be to help our kids develop a love for reading first. They can master the mechanics of reading later. Some of the best children’s books that can help do that are personalized children’s books, like those available from The Kids Book Company, books where every child stars in his or her very own story.